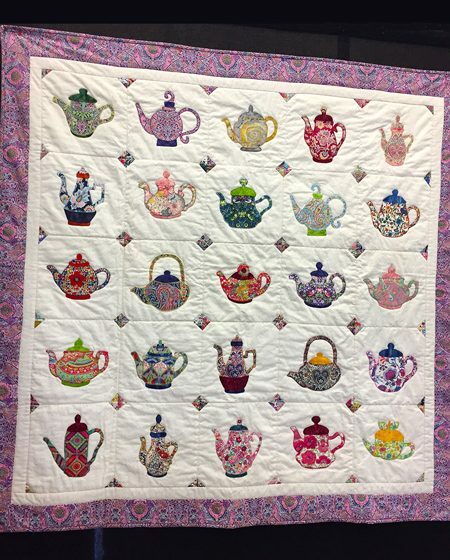 I recently received an order for my book Teapots 2 to Appliqué from a quilter living in New Zealand. She told me she had see a quilt made from the designs in a show in Orewa. I was intrigued!! I asked her for a little more information, and she sent me a photo of the gorgeous quilt. It’s made with all Liberty fabrics!! 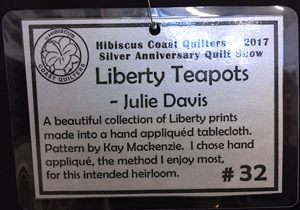 The Hibiscus Coast Quilters of Whangaparaoa, New Zealand, put me in touch with the maker, Julie Davis. Julie shared the following about her project. Those are some lucky friends! Thank you Julie, for allowing me to share, and I’m so glad you had a good time with the designs. And thank you Tish for letting me know about the beautiful quilt. Will look forward to seeing your teapot creations as well!